To achieve rapid reductions in greenhouse gas emissions leading to global net zero emissions by 2050, while ensuring climate-resilient development. Our mission is to stimulate a shift in the direction and scale of private and public financial flows into investments which are consistent with the objectives of the Paris Agreement. CMIA and its members do this not only by developing the necessary investment opportunities but also by helping to establish the enabling environments needed to increase deal flow to the scale required. We recognise that this shift will only happen alongside broader efforts to achieve sustainable economic growth in line with the 2030 Sustainable Development Goals. both by providing a forum for members to share knowledge and opportunities for joint working and by engaging with other organisations who share our vision and mission. 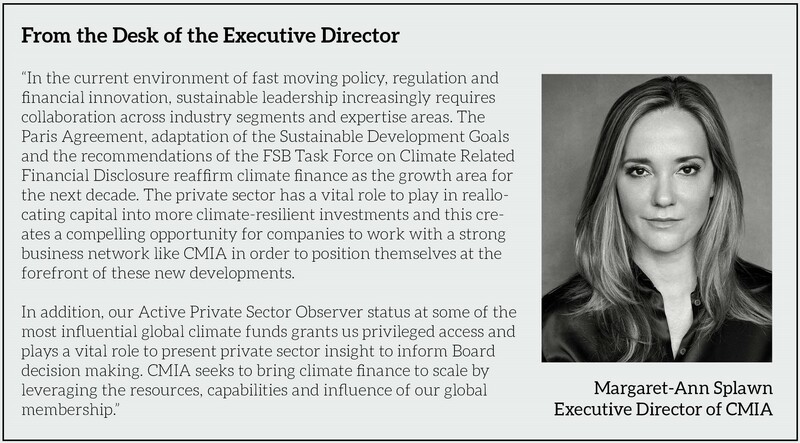 by building capacity and understanding of its members on hot topics relating to the financing of climate action, as well as providing access to key events, thought leaders international institutions and funding opportunities. how best to achieve our vision by speaking with authority, clarity and ambition on the design of policy environments (including carbon pricing, financial regulation and effective use of public sector funds) based on real economy investment experience. In particular, we use our Active Private Sector Observer seats at the Green Climate Fund and the Climate Investment Funds to ensure that the voice of the private sector is heard in those fora. Click here to learn more about what we do and what we offer our members.